I let Ellery put together this project herself. It was such a positive experience. Not a huge time commitment, but a great science introduction. Building blocks for the future. Those 2 words were the pride and bain of my teaching experience. It was a massive amount of work, but I believe it is was probably the only experience my students will really remember from the class. I was an intense teacher. It took us around 3 months. First they would turn in their question. Next hypothesis. Experimental design. Data. We would learn on how make graphs in excel during class. There was no procrastination. Last year, I told our brand new principal I would bring the Science Fair to our elementary school. He has really been trying to bring a new degree of excellence to our school. A school which was really struggling. To his credit he has made some very positive changes in his first year and a half. We met with quite a bit of resistance on all fronts. Teachers. Parents. But we decided to push ahead, as several of us feel adamant about the positive learning experience Science Fair can afford. The Fair was tonight, and it was a resounding success. Most of the teachers stepped up and the children did a wonderful job, for the first year. Adding 1/2 cup xylitol to the lemon water. Only the 5th and 6th graders can advance to the District Level. They were the main focus and used the tri-fold boards. But the entire school participated. There were some interesting conclusions I was able to draw from this experience, but they are not appropriate to share on this blog because it is public. Simply put, teachers make a difference. A big difference. Especially if parents are not extremely involved with their child's education. The three sweeteners Ellery wanted to use. Xylitol, Agave Nectar and Maple Syrup. We pulled our Lemonade "stand" around on the wagon, Ellery with her clipboard to keep tally. Hooray for learning celebrations! It would be exciting to have other hands-on learning return to the school. Each grade level ought to have a curricula tradition that children eagerly anticipate. What a great learning experience for Ellery. You are such a great influence in your school. That's so great that you did that! 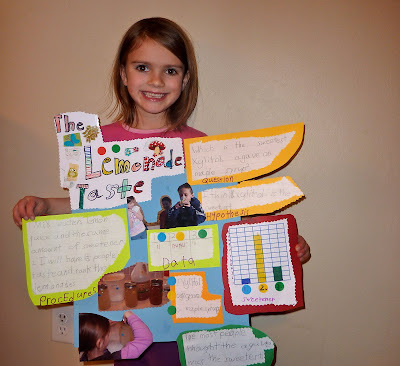 My science fair projects are some of the things I remember most from elementary school. And a what a great project for Ellery!